The prices below are for babywearing educators, babywearing groups, lending libraries, and other qualified individuals. This page is visible only to those who have the appropriate login. 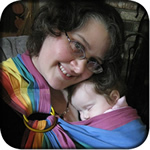 If you have friends who run or volunteer for organizations and will be using slings for educational purposes, please encourage them to create an account with SBP (using the 'create an account' link above) and email me, and I can approve their account for these discounts and special promotions. Please remember to order from this page, not from the navigation links at the top or side of the page, as the other links are retail priced. Only this page has the discounted prices and special offers. I recommend bookmarking this page so that you can come back to it when you're logged in.